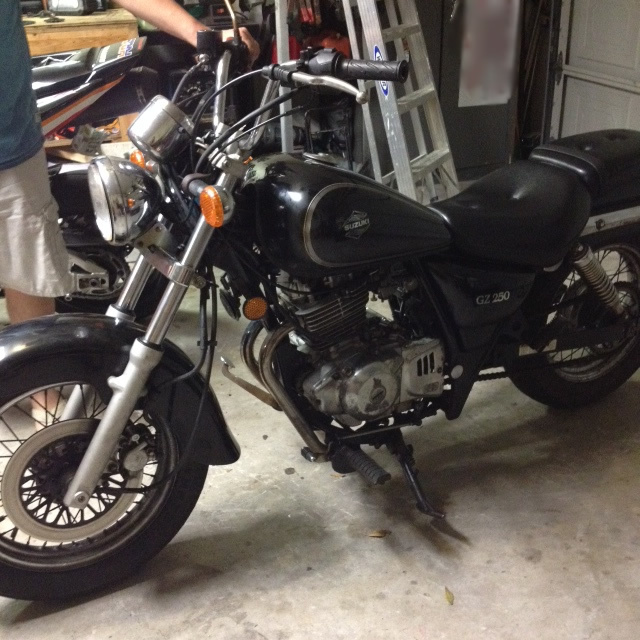 Today my husband, who has been riding motorcycles off and on for about thirty years, gave me my first lesson in riding a motorcycle. I was terrified, to be honest, but his care gave me some immediate knowledge that I was able to use right away. To back up a moment, my third book in the Gargoyles Den series is about to commence and in it, one of my main characters is taught to ride a motorcycle by her lover. I knew this was coming while I was still writing the second book. Although I have grown up with a Harley riding dad, married a rider and watched my son learn to ride a few years ago, I however, was not a rider. Not because I wasn’t interested but more because I was scared and didn’t have a good enough reason. Two things happened to change that. One, my husband, who buys, fixes and sells motorcycles and cars here and there, went to see a motorcycle and though he wasn’t interested in it, the person also had a little Suzuki GZ 250 that wasn’t running. It was sitting there looking lonely and my hubby offered a $100. Sold! Within days of getting it home and giving it some love, he had it happily purring away. He then offered it to me if I was interested. Two, I needed to be able to explain, from my character’s point of view, how in the world to ride a motorcycle. I couldn’t do that well without the experience. Sure, I could interview my family and get their view, but how much better would it be if I learned for myself? Way. Yep. Way. 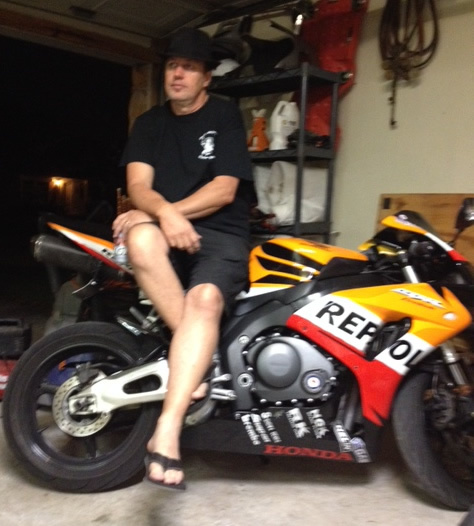 So, first things first, Kimbo pulled the bike into the driveway and had me sit on it. He then pointed out the basics. The breaks, the clutch, the gear shifter, how the gears work. The first thing I realized was that knowing how to drive a standard car or truck made this MUCH easier for me. Though, I was still scared. See, the clutch is on the left handlebar. The front break is on the right handlebar. Yeah, what? Exactly what I said! The gear shifting is done with your left foot. Um, ok. Assuming the bike is in Neutral, press the shifter down once for first gear. To go back into Neutral, a very gentle shift upward. Apparently, and I haven’t tried it at this point, lift the shifter again to go into 2nd gear, up again for 3rd gear and so on to 5th gear. Kimbo then showed me how to turn the bike on. (Important detail.) Turn the key to on position (no, Im not drinking at the moment), then hit the ‘On’ button. Ta da! Engine roars to life or in the case of my little bike, put-puts to life. He then showed me a little lever called the ‘choke’. Remember, if you ever are angry and want to choke something, get a motorcycle and do it without going to jail. The choke does something or other which Kimbo told me but I forgot and somehow helps the engine warm up. I took the picture when he wasn’t paying attention. Mwahahaha! And no, he doesn’t ride wearing flip flops. We just live in Florida so even in November we wear flip flops for all times. Except riding. When we can wear boots. Yay boots! He had me turn on the bike, put it into first gear (hold down the clutch and shift down) and practice letting out the clutch slow and letting the bike “move” itself forward while I “walked” it along, breaking periodically. I did this activity up and down the street several times. This was easy, not scary and he was there walking right next to me (sometimes running hehe) the whole time. I never went over 5 mph. Then I figured out how to go to the end of the street, turning around, and coming back without watching my hubby run beside me. I gave him a break and he watched and I continued, by myself to go up and down the street a few more times before calling it a day. It was the best lesson I think he could have given me. It was at a speed that I could tolerate and enjoyed myself while getting a feel for the bike. I’ll post the next lesson soon!